Newer luxury 3-bedroom, 2-bathroom high-rise, top-of-the-line condominium on floor 12 in the 34-story Holyland Tower building, in Holyland Park. The condo has an open layout, and is completely furnished. It is very beautiful, quiet, and very sunny and bright all day. 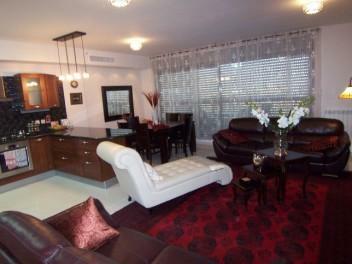 It is located in the most desirable location in Jerusalem. Like a 10-star hotel! It features top-of-the-line finishes, wall-to-wall off-white Italian porcelain flooring throughout, a large living room/dining room combination, and a gourmet granite kitchen with top-of-the-line stainless steel appliances. There is a deck with a gas barbecue grill, and an amazing panoramic views of Jerusalem. The master bedroom has a large walk-in closet and an en suite master bathroom with beautiful marble counter-tops and a great shower. The second bathroom has a Jacuzzi tub. The condo has its own washer and dryer, and is completely furnished with top-of-the-line furniture, linens, towels, and everything you need. The building features a full-time doorman and a full fitness facility with weights, machines, aerobics equipment, and a sauna. It is in a great location: 5 minutes to Malha Mall, with lots of shops and restaurants; 10 minutes to Downtown, Mamila Mall, and to the Old City; and within walking distance to a synagogue. Freeways are close by for easy access to Tel-Aviv, Haifa, the Dead Sea, Eilat, and more. Two-car parking in the building is included.